You can conveniently order quality cedar barrel sauna kits directly from a top Canadian manufacturer in Ontario over the internet, and have it shipped to the United States or anywhere worldwide. Saunakits.com is a leader in the sauna business of these do-it-yourself-kits and they make it their job to help you with any sauna need. 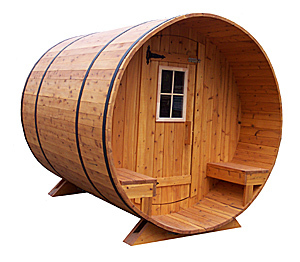 What is a Barrel Sauna? Barrel saunas are no different than saunas built from other kits — the term barrel just describes its characteristic shape. It’s not just for ascetic reasons that they’re built this way, they are functional too: the round design has better heat rotation than a box sauna since there’s 23% less area to heat. But what’s really attractive is that these cedar saunas look something like a giant beer keg found at a German beer garden. Cedar barrel saunas are one of the most attractive and unique designs you’ll find in an outdoor sauna. 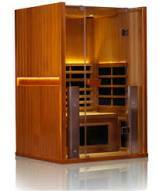 They have the traditional wood construction and the cedar aroma adds a special quality to the sauna experience. Inside, the rounded walls don’t take away any headspace either as the sauna is roomy enough for up to eight people at once. (All cedar barrel sauna kits measure 7' in diameter.) They come in different cottage-size lengths including 6', 8', 10' and 12', and even have a spacious 4' anteroom or change room. You can even order a porch add-on for the front of the unit. The barrel sauna kits come with your choice of Eastern White Cedar (EWC), Tight Knot Western Red Cedar and Clear Western Red Cedar. The panels or staves are 1 3/8" thick x 5" wide with a special tongue and groove joint for easy assembly. These easy outdoor kits are completely portable so you can take it with you when you move. They are free-standing units and those that are designed for use with wood-burning stoves won’t need any electrical hook-up. Before you purchase your kit, you will speak directly with a company rep to discuss the sauna’s requirements (base, electricity, etc.) in detail to assure that you will get the right unit for the location you plan to put it in. Prices start at $5200 for one of these outdoor barrel saunas depending on the size and the type of wood you select. And here’s a bit of news to save you money: the cedar barrel sauna kits from SaunaKits.com are 100% duty free to American buyers thanks to the NAFTA agreement.